Arch-terrorist Marwan Barghouti is considering challenging Mahmoud Abbas as PA chairman - from prison. MK Yosef Jabarin (Joint List) traveled to Hadarim Prison today to visit with Palestinian arch-terrorist Marwan Barghouti - who told him he is seriously considering to run against Abu Maazen as chairman of the Palestinian Authority. Barghouti, a one-time Palestinian peace politician, later turned to terror attacks, and is considered the driving force behind the first and second intifadas, which killed some 1,500 Israelis. Barghouti is responsible, among many acts of terror, for a major attack at the gas station in Givat Ze'ev (northeast of Jerusalem) which killed Yoela Hen. According to the indictment submitted against him, Barghouti gave direct orders for the murderous attack. Similarly, Barghouti is responsible for a terror attack in the eastern city of Maalei Adumim, in which a Greek priest was killed. 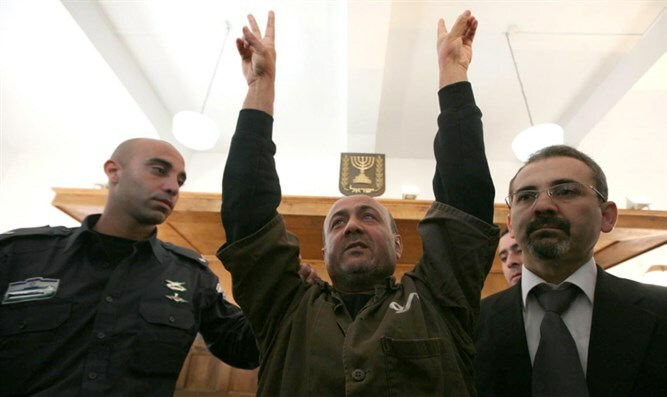 Barghouti also gave his approval for the "Sea Food Market" attack which killed three Israelis. He was also the mastermind behind a car bomb explosion near Malha Mall in Jerusalem; no Israelis were wounded in the attack. Barghouti has been sentenced to five life sentences in prison. During their meeting, Jabarin and Barghouti discussed efforts to reconcile split Palestinian factions before the upcoming Palestinian municipal elections, which are set for October. Barghouti emphasized that the success of the local government elections could pave the way for democratic elections in the Palestinian Legislative Council, and the office of the chairman of the Palestinian Authority after Abbas - which would give him a chance to supersede Abbas. Jabarin said after the visit that Barghouti believes in strengthening Palestinian democracy through regular democratic elections for all government bodies. He was impressed by the terrorist's considered intent to run for chairman of the Palestinian Authority - from prison.